Breakfast is the most important meal of the day, and one I insist that my kids eat every day. Unfortunately, many of us neglect breakfast. And there’s a lot of evidence to suggest that your body and mind will suffer unless you have a healthy breakfast each morning. You spend six to eight hours sleeping. After that time, your body needs fuel to keep going. Without breakfast at home, your options for on the run nutrition may amount to too much fat, too much sugar and too many carbs. Besides, that convenient run to the fast food joint is not as convenient and time-saving as you think… if everyone else has the same idea. The fifteen or twenty minutes spent in line could have been used to fill your belly with something good at home. 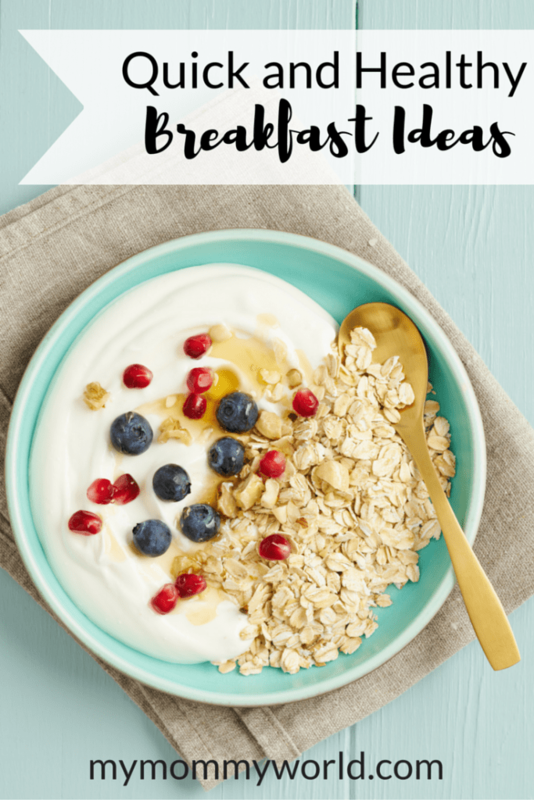 If you are the type to skip breakfast, here are some quick and healthy breakfast ideas that you can use to help keep hunger in check as well as give you the natural energy boost to start your day. 1. Oatmeal – This food makes a good hot meal that contains lots of filling fiber to keep you from getting hungry later on in the morning. Depending on your taste, you can take five minutes to fix it on the stove or use the microwave for instant oatmeal. Kids tend to like the variety of flavors that come with instant oatmeal. The night before, put together a container of add-ins like blueberries, strawberries and bananas that can be tossed on top for a bit of antioxidant power. 2. Fruit smoothies – These are good any morning but particularly on a hot day. You’ll have to blend the ingredients together in the morning, but the prep work can be done at night. Cube your fruit and place it into a container, or just buy bags of frozen mixed fruit, such as a berry blend. Instead of frozen yogurt in the morning, use a cup of plain yogurt. Add ice cubes, a little milk or juice, and blend. 3. Egg sandwich – The eggs can be cooked the night before and placed in a sealed container (I cook mine in a muffin tin in the oven). In the morning, warm up the eggs in the microwave. If you want, add some chopped veggies or shredded cheese. Serve on toasted wheat bread or an English muffin. The night before, place two pieces of bread into a Ziploc bag for each family member. They can toast their bread as they get up and place the sandwich in the bag for easy transport in the car to work or school. 4. Yogurt with granola and fruit – Some people like to eat yogurt, but yogurt by itself won’t keep you from being hungry. Add some granola and a few blueberries or banana slices to the mix. This makes a great breakfast idea for those mornings when you are running late. Keep small bags of granola and blueberries in the fridge next to the yogurt so you can grab them and run. 5. Muffins – When you have some extra time on the weekend, bake up a big batch of your favorite muffins (we like blueberry or Pumpkin Chocolate Chip), and store them in your freezer. My husband likes to grab one or two out of the freezer on his way to the gym…they defrost quickly and are ready for him to eat when he gets to work. Are you fighting the breakfast battle? To get a filling meal you don’t have to opt for too much fat, calories or carbs. These quick and easy breakfast ideas can be made within minutes and are a much healthier alternative to skipping breakfast or grabbing a high fat alternative. Great suggestions for breakfast ideas. We have are set breakfast during the week of toast and eggs sometimes with a little oatmeal. But if I have made items ahead for the freezer we will mix it up a bit with English muffins, regular muffins or smoothies from the freezer. I always plan something a little more special on the weekends like waffles, pancakes or omelets. We even have breakfast for dinner once in a while which my family loves. It’s hard to believe that I used to not eat breakfast growing up, I just was never hungry until lunch, but now I eat breakfast almost everyday and so do my kids. Oh, my husband was the same way…he never ate breakfast until he married me! But now he eats it everyday, and enjoys home baked goods from the freezer. A great collection of ideas for a healthy breakfast! Hope you are having a good week and staying warm. Thanks so much for sharing with us at Full Plate Thursday!